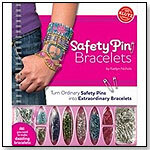 Safety Pin Bracelets helps anyone craft an entire collection of sparkling beaded jewelry out of garden-variety safety pins. The book includes 12 dazzling bracelet designs. Whichever design kids choose, they pick the colors and patterns so each bracelet is unique. The book comes with everything that is needed: 175 safety pins in three different sizes, over 1,000 beads in vibrant colors, and silvery elastic cord. Finally, the open-and-shut packaging keeps all the craft supplies organized and neat.